For the first week of May, CSUSB held an assortment of activities to celebrate Cinco de Mayo across both campuses. Cinco de Mayo is a Latino holiday that commemorates the victory of the Mexican army during the Battle of Puebla on May 5, 1862. In San Bernardino, the Cross Cultural Center hosted four days of events to showcase the national heritage and importance of the holiday. A program called “The history that was banned” took place on May 1. This gave students the opportunity to view books and films that were banned under Bill 2281, which prohibited Latino education to be taught in Arizona schools before being overturned by Supreme Court Justice, Sonia Sotamayor. An assortment of Latino books were on display during “the history that was banned” (Crystal Harrell/Chronicle Photos). 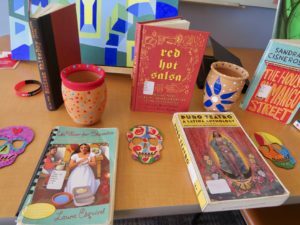 Some of the titles on display included “Like Water for Chocolate” by Laura Esquivel, “Bless Me Ultima” by Rudolfo Anaya, and “The House on Mango Street” by Sandra Cisneros. On May 2, a poetry reading by artist and musician Elisa Suzanna Grajeda-Urmston was held in room 202B at the Santos Manuel Student Union. “Cinco de Mayo is representative of having freedom and taking chances when it comes to advocating for your agency. Elisa encompasses just that, for her literature is reflective of being a Latina woman in marginalized spaces,” said Multicultural Coordinator Turajha Moore. 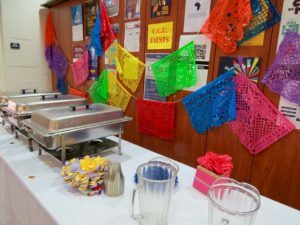 “La Celebracion de La Batalla de Puebla” took place on May 3, which featured authentic Mexican cuisine and music for students to enjoy at the Cross Cultural Center. The four-day celebration ended on May 4, with screenings of the film “Cinco de Mayo La Batalla” in the LatinX Center. Mexican cuisine was available at the Cross Cultural Center (Crystal Harrell/Chronicle Photos). “During this particular week, we often see programs that encompass a celebration when in fact [Cinco de Mayo] was a day that many lost their lives for liberation. The film depicts this battle and gives viewers a realistic view of that day. It’s not about local businesses selling Latin cuisine or celebrations,” Moore said. The week-long event promoted a cultural awareness that Moore feels helps students at CSUSB gain new knowledge and perspective. “I believe it’s important to always show the historic importance in a way that allows students to have fun and to learn about themselves. They get to celebrate Latin culture as a whole all the while learning the real significance of Cinco de Mayo,” Moore said. 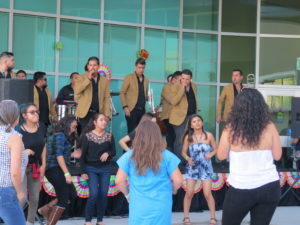 A live banda performed at the CSUSB Palm Desert Campus (Crystal Harrell/Chronicle Photos). At the Palm Desert Campus, a Cinco de Mayo celebration took place on May 3. The festivities started with a free screening of the animated film “Coco” at the Indian Wells Theater, followed by a fiesta that took place outside of the Health Science Building from 3 p.m. to 6 p.m. The first 200 people received tacos from local vendors, and a banda was there to provide live music and entertainment. “The Cinco de Mayo celebration was a fun event filled with culture and Coyote Pride. My favorite part was the banda and the dance team performance,” said Palm Desert Campus student Spencer Winkle. With a large Hispanic population in enrolled, CSUSB commemorated this historically significant holiday while embracing the culture of its student body.